Callie seems to be limping, but we can't figure out why. It's most noticeable when she gets up from lying down. But on her walks she seems normal. There's no thorn, no cut, nor any other visible problem. She may have twisted her leg or something. Watch out for dogs in the grass. We've both gently manipulated her leg to see if she shows any sign of pain, which she doesn't. We'll keep an eye on her to see if it gets better on its own or not. Then we'll have to consider a trip to the vet. 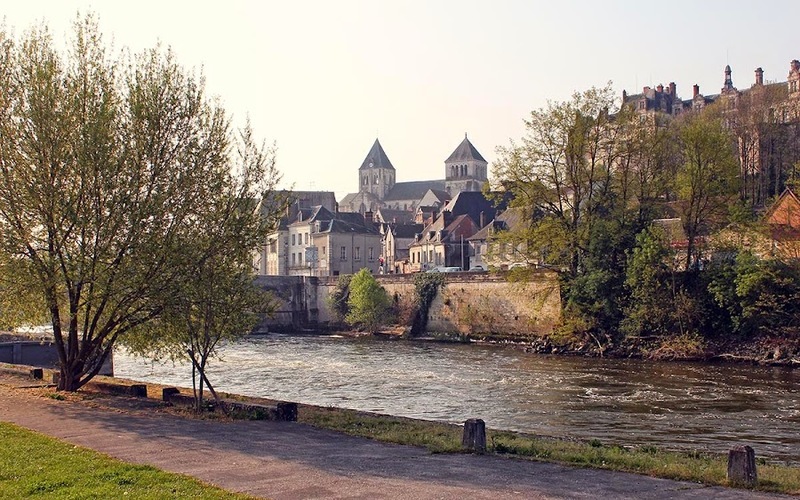 This is a view from near the bridge in Saint-Aignan looking up into town. The church's towers are prominent. On or near this site stood the old flour mill. It was built into part of the bridge and extended onto the south bank. Here is an old photo of the mill from www.saint-aignan.org. The rue Paul-Boncour rises up from the river toward the middle of town. Now, long abandoned, ravaged by fire, and finally demolished, the only traces of the mill are the foundations in the river where water powered the millstones. The street has been straightened, and a small parking lot now sits along side. The town does a nice job maintaining a flower bed at the entrance to the old center. I've shown you these trees before, but here they are again. They span the path that leads down the hill toward the river, the path that is blocked to us for a while now that the electric fence is activated. The fence between the woods and the adjacent vineyard helps keep the deer from munching on the emerging grape leaves and flowers. The trees blew over in a storm about four years ago. One day, mother nature or someone with a chainsaw will take the trunks down. 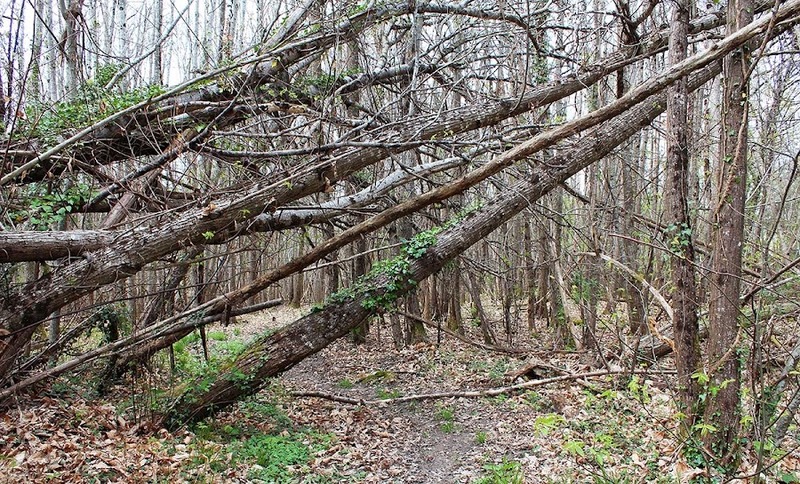 The path is a municipal right-of-way (I think), so if they fall, the town may send someone out to clear the way. 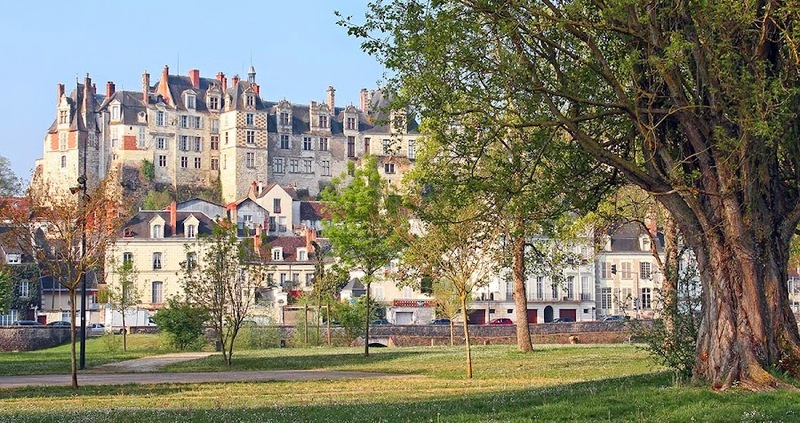 Here's a peek at Saint-Aignan's château on the heights overlooking the Cher River. I'm standing in the park on the island in the river facing more or less toward the southwest. The buildings below the château are right on the riverbank. The château is privately owned and lived-in. No tours. I took the photo on a Saturday morning two weeks ago. I was back at the market in town yesterday, but without the camera. It was raining. I did pick up some strawberries, some lemons, a head of lettuce, four spicy sausages, and a slice of local pâté made with walnuts. 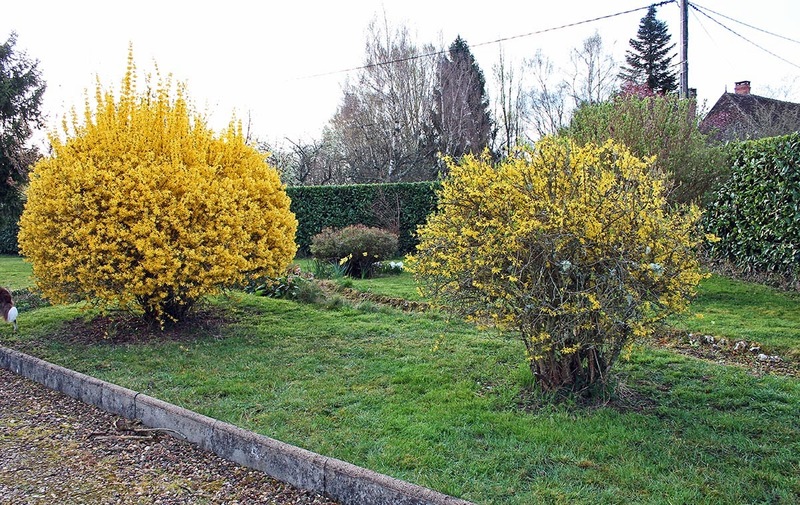 The large forsythia on the left is greatly reduced in girth. The one on the right is gone. April 25, 2014. Both forsythia back at end of March when they were in full flower. You can see that the smaller forsythia was not healthy and that I've removed it almost completely. The stumps are still there for now. They may re-sprout before I get around to digging them out. Behind where it used to be is a deutzia shrub that I pruned back last year (it's more visible in the top photo). It's now covered in flower buds that will bloom in white very soon. Once the flowers go, I'll reduce the height of the shrub. I plan to do the same with the tall forsythia (on the left) next year, after it flowers. I got some work done in the back yard on Thursday. 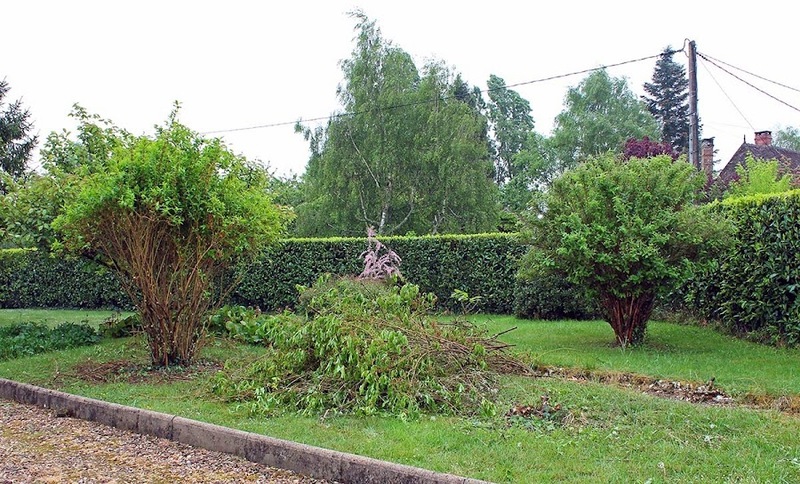 I've been thinking about the forsythia for a while and decided to remove the smaller one of the two shrubs. It's had fungus on its trunks and, although we haven't seen it again, the shrub was obviously not well. I cut all of it down to the ground. There was a lot of dead wood and the central stem had rotted and it pulled right out. 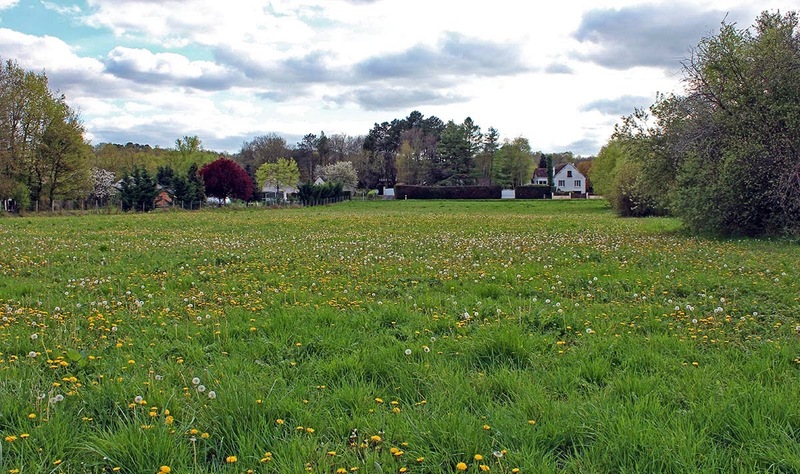 Can you see Bert lounging in the grass (in the center)? The forsythia are not in this photo. The larger bush is healthy, but it's gotten too big to deal with and it's difficult to mow around. So I started removing stems. It took a while to work my way around the plant, but now it's done, at least for this year. I left a good amount of green leaves to keep the plant alive. Next year I plan to remove some height. I'll try to do some before/after shots soon. Well of course I have to show you what the hotel looks like. And here it is. 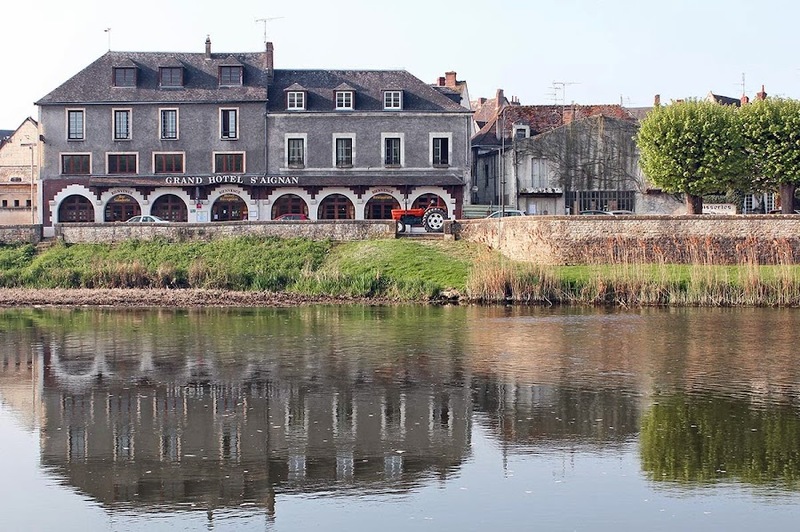 I was walking on the island in the river, juste en face de l'hôtel (right across from the hotel), when I saw a big tractor sitting in traffic behind the stoplight. So I snapped away. I liked how the orange of the tractor contrasted with the greys of the hotel. There's always a tractor of some sort on the road. I waited for the light to change and the traffic to start moving so I could get the tractor's big rear wheel in the photo. It's a testament to our rural character that there are tractors on the main roads, going from barn to field. Commuting. Saint-Aignan's largest hotel, I think, is the Grand Hotel on the river. There's a bigger hotel out by the zoo, but that's much newer and not in town. The Grand Hotel is a very typical French hotel. I've never stayed there, but I know people who have and I've seen some of the rooms. It was renovated not too long ago and has all the modern conveniences, but still a lot of the old French charm. The roof and the upper rooms of the Grand Hotel on the quai in Saint-Aignan. Notice the curly-cue lamp posts. The hotel's facade is hidden by the trees in the picture. This is the hotel's setting, facing the Cher River, with its back to toward the center of town. The blood lab, where Ken and I get our annual blood work done, is just to the left of the hotel in this photo. 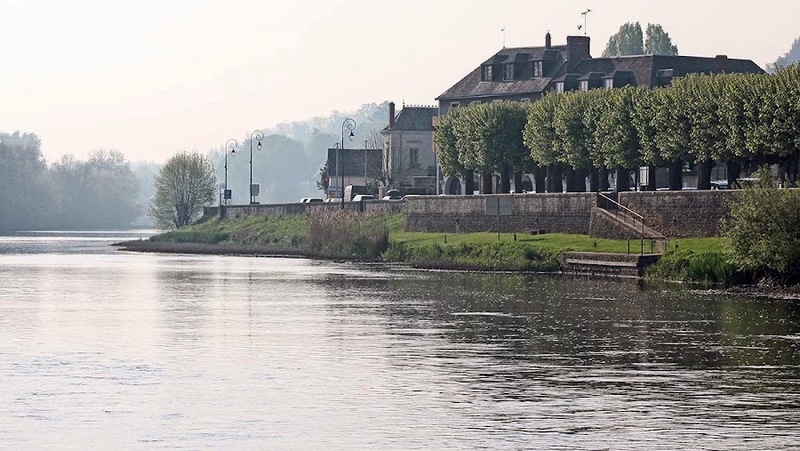 This is a view of Saint-Aignan's church from the south bank of the island in the Cher River. Not much to say except that it was a nice spring morning. The trees were just beginning to leaf out. I took this photo just over a week ago. The bridge across the river is just behind the tree on the left. The château looms up on the right. Monday was rainy most of the day. It was a very light rain, only two millimeters in the gauge. Our neighbors across the street had a family gathering, easily eight or ten cars altogether. It's too bad they had to stay indoors. This is the bridge over the Cher at Saint-Aignan. More accurately, it's the southern span that connects the left bank (at my back in the photo) to the island, which is quite long, but narrow. The municipal swimming pool is on the island, as well as a good-sized park and the town's garden allotments. Another span to the north of the island connects to the river's right bank. 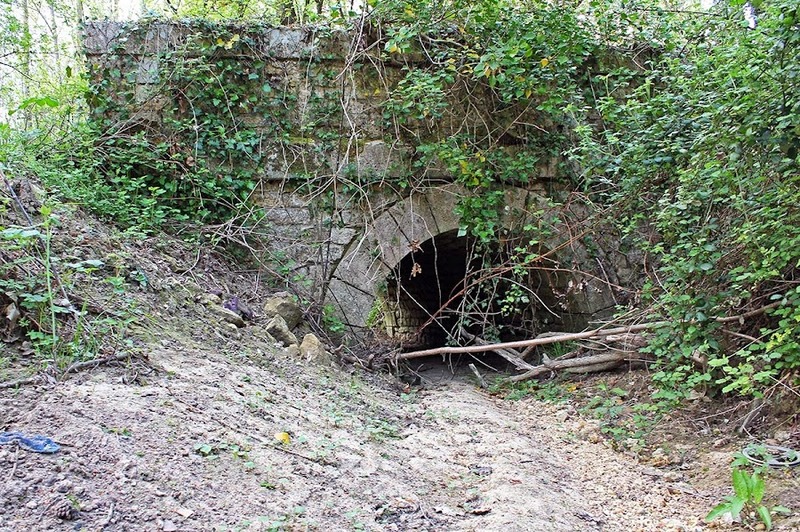 It's here on the Saint-Aignan side that you find the lock and the foundations of the old mill that used to operate adjacent to the bridge. You can see the lock on the island side of the river. The main stream flows under the bridge's two middle arches. It rained a little overnight. I heard the drops on the loft windows at one point and the ground is wet this morning. But I don't think we got very much in the way of water. Today is a holiday in France. We won't notice, except that garbage will get picked up a day later than usual. Bonne idée ? Today we'll cook our annual rabbit dinner, but with a twist: I'll be cooking the bunny on the barbie. I don't think I've done that before. We're also planning to have spaghetti squash (yes, we still have a few from last fall's harvest) and some collard greens, also from our garden. 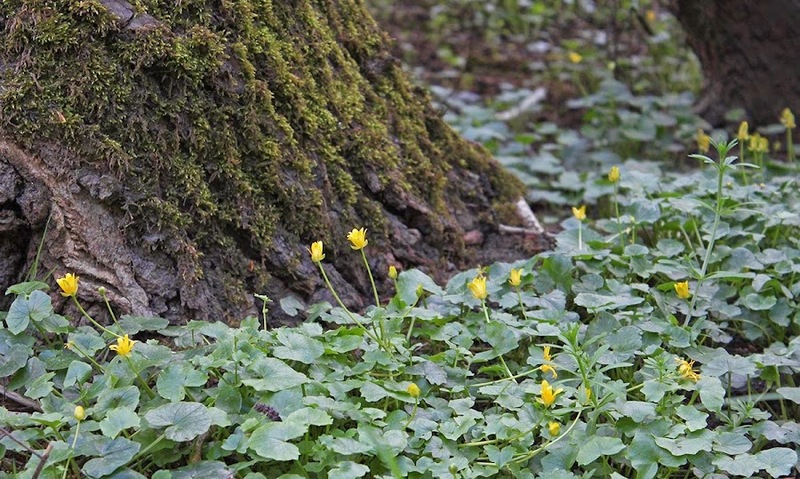 Little yellow flowers grow under a tree by the river. It'll be interesting to see what goes on in the neighborhood today. Most of the out-of-town neighbors are here for the weekend. I expect some of them will be receiving family and/or friends for Sunday dinner. Watch out for trolls! Actually, this bridge crosses a stream bed very close to the Cher River, not far from our house. The stream gets it's start up in the vineyards behind us. It's named, I think, l'aulne (alder) after the trees that are commonly found along water courses. There was no water in the stream on this day; it was bone dry. It's Easter weekend and we are preparing for our annual rabbit dinner. This year Ken wants to grill the bunny, so we'll cut it up into pieces and marinate it with a spicy mustard sauce overnight tonight. One of our local supermarkets had a special on rabbits two weeks ago so I got a couple and put them in the freezer. 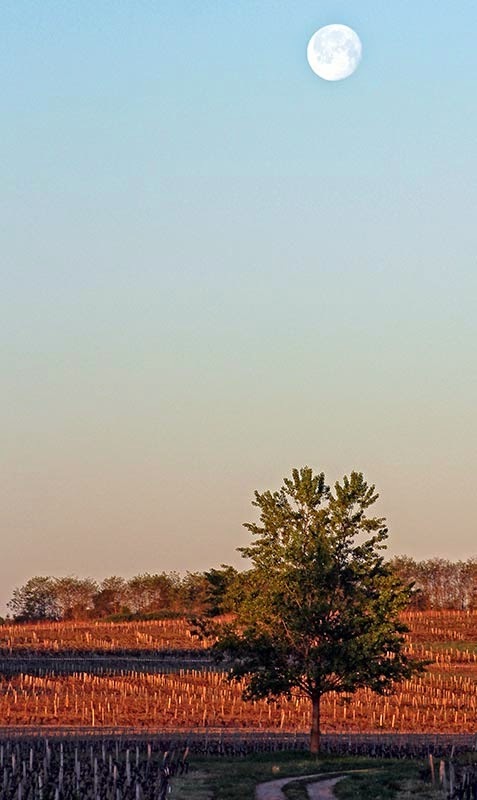 When I got up Thursday morning I saw the just-past-full moon setting in the west, lining up nicely with that lone tree out in the vineyard. I wanted to take a picture, but my camera wasn't ready. No card, wrong lens, and the tripod base was not attached. I scrambled to get it together before the moon moved out of position. I took a few shots without the tripod and this is the best one. A nice clear morning. The photo would be a little crisper had I used the tripod. My tripod has a base attachment that screws into the bottom of the camera. That way, putting the camera on and off the tripod is done with a simple click. But for it to be quick, you've got to keep the base screwed onto the camera. The last time I replaced the camera battery I didn't put the tripod base back on. That'll learn me. 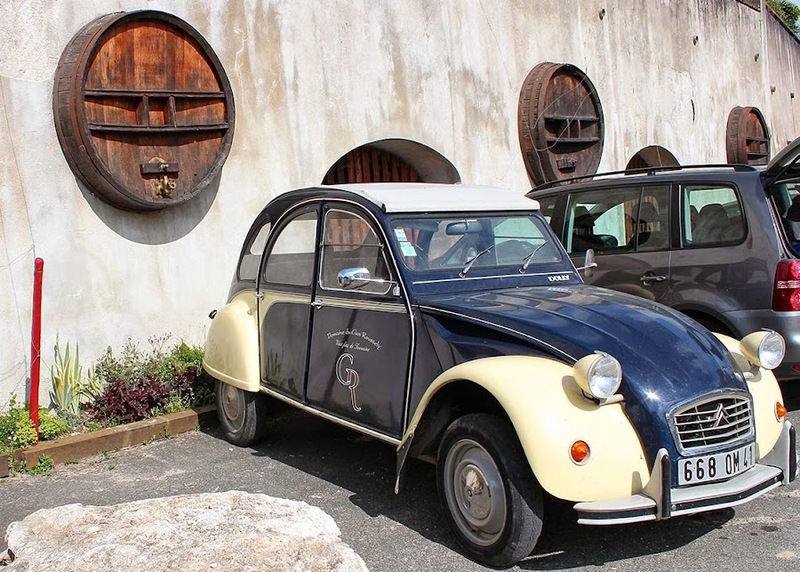 This 2CV was sitting outside the Clos Roussely winery on Sunday. My friend noticed that it's named Dolly. I don't know anything else about it, but it's pretty, non? The official winery car. Every winery should have one. Ken is home and getting back into his regular routine. Callie was very happy to see him, but Bertie is pretending not to notice. He'll come around soon enough. Dogs and cats, eh? Since Ken is arriving home today after a couple of weeks in the US, I thought I'd make something French for him. I'm sure he's been enjoying seafood, barbeque, and hamburgers at home in North Carolina. 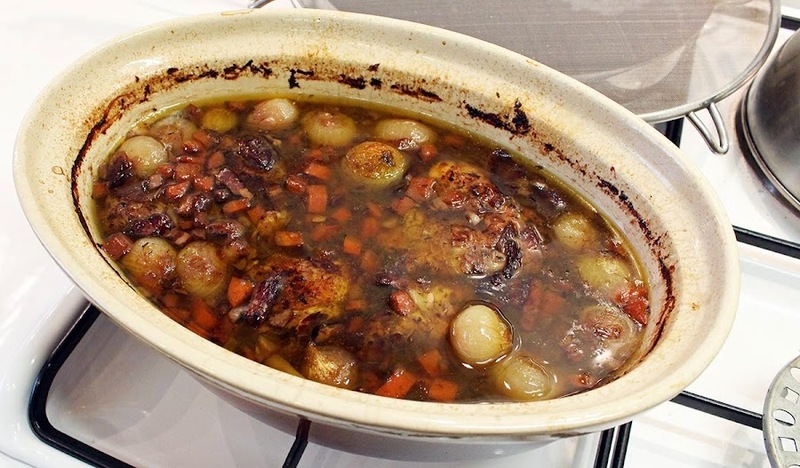 So, as a change, I made my version of the classic French coq au vin (chicken in red wine). 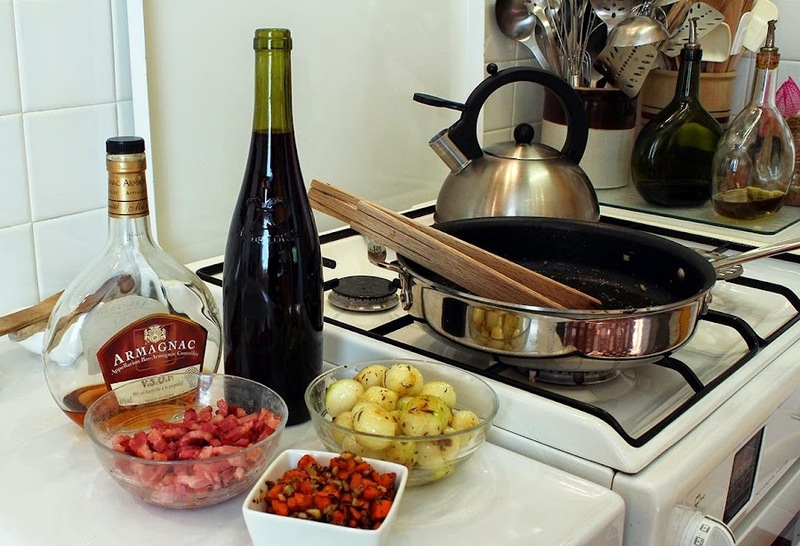 The sauteed pork, onions, carrots and garlic, along with armagnac and red wine. 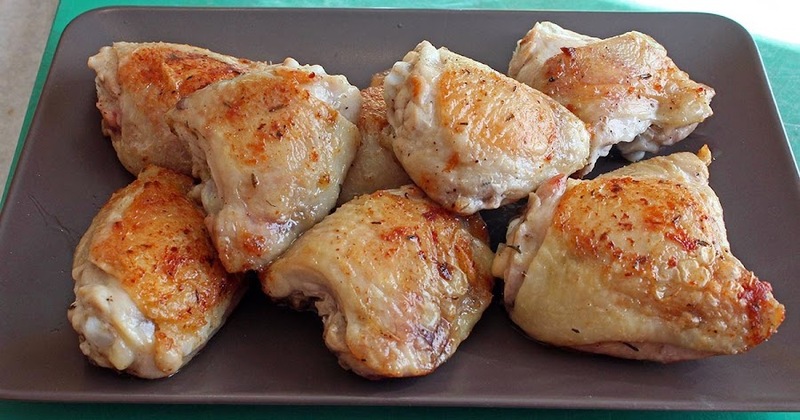 Rather than use an old coq (rooster, the traditional ingredient), I used haut de cuisse (thighs), with bone in and skin on. First I sauteed some smoked lardons (bacon) and followed that with diced carrots, garlic, and some whole small onions. I seasoned with pepper, and added tarragon and thyme (I didn't add salt because the bacon is salty -- I'll correct if necessary once it's finished). Then I browned the chicken. When the chicken was golden, I removed it from the pan, put the vegetables back in, and sprinkled some flour on them to give the sauce a little body. Browned chicken thighs. As an alternative, the chicken can be marinated in the wine with the vegetables overnight before it's browned. Next, with the vegetables back out of the pan, I de-glazed with some armagnac. 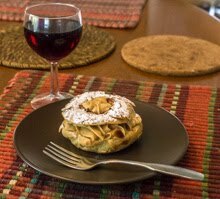 I put all of the ingredients into an oven dish along with some bay leaves and black pepper, then poured in a bottle of our local red. That went into the oven to cook slowly for a few hours. It spent the night in the refrigerator and will be reheated this afternoon -- dishes like this are often better the next day. At that point I'll add some mushrooms that I sauteed this morning. Nearly finished, after three hours in a slow oven. There's a layer of clear fat to be skimmed off the top, but you get the idea. Ken may be too jet-lagged and tired to eat. But maybe not. 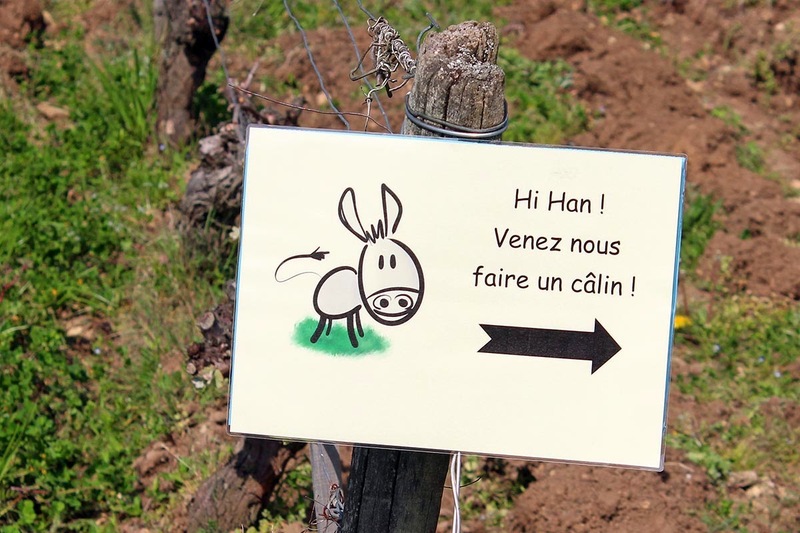 I mentioned that Clos Roussely (the winery I visited on Sunday) is an organic operation. One of the things that means is that they don't use herbicides to keep the weeds down in the vineyard. Organic growers will either mow or more commonly plow the rows in between the vines. Plowing helps control the weeds but probably also helps by aerating the soil. Munching on a bit of spring grass. The plowman is standing behind. Most growers plow with a tractor. 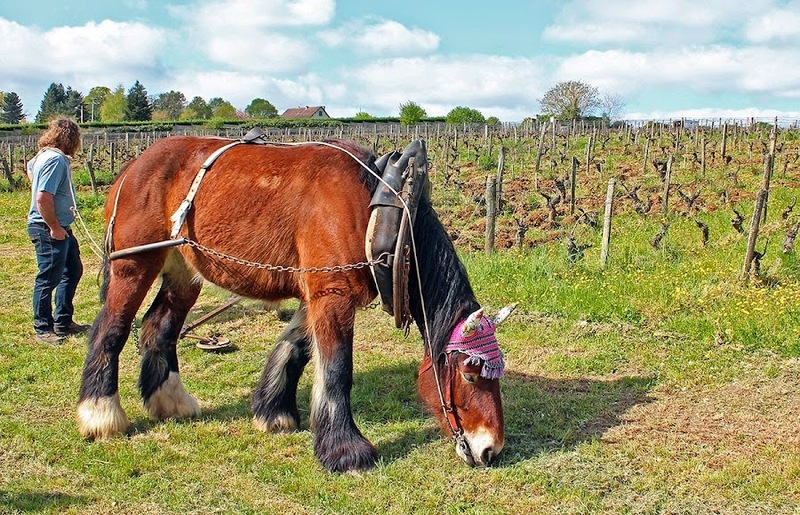 But Roussely works with a guy who uses his horse to manually plow up the rows. Apparently he hires his services out to other local vintners as well. I asked him what breed the horse is and naturally forgot it as well as her name. But I do remember that she's a young'un at four years old. She was having a well-deserved break while we tourists had a look. Pointing the way to the horse (but the drawing looks like a donkey). "Hee-haw! Come give us a hug!" Friends K&J invited me to tag along with them to a local winery open house on Sunday. 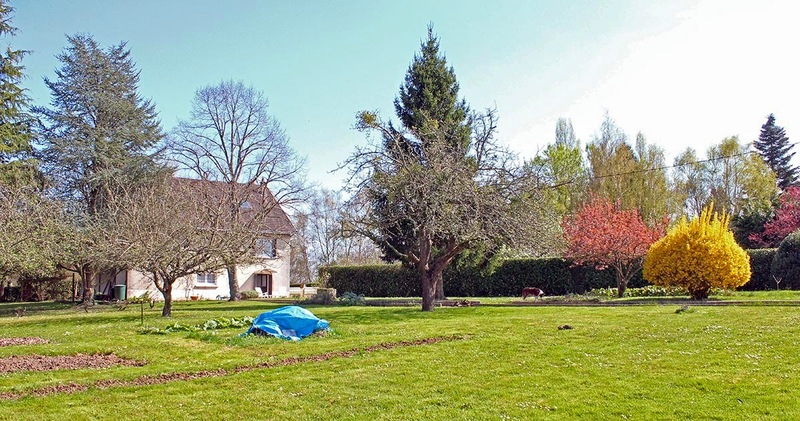 The owner, Vincent Roussely, recently (a few years ago) bought his family's former wine operation and updated it. 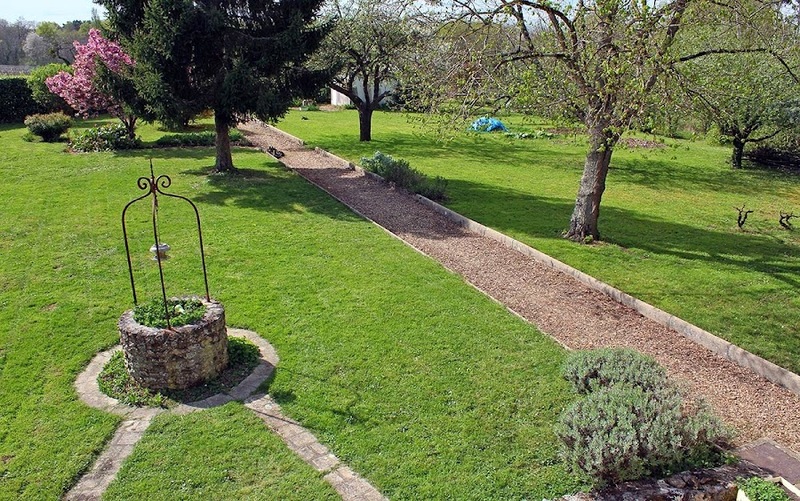 He grows the traditional Touraine varietals, gamay, cabernet, côt, and sauvignon, all organically. 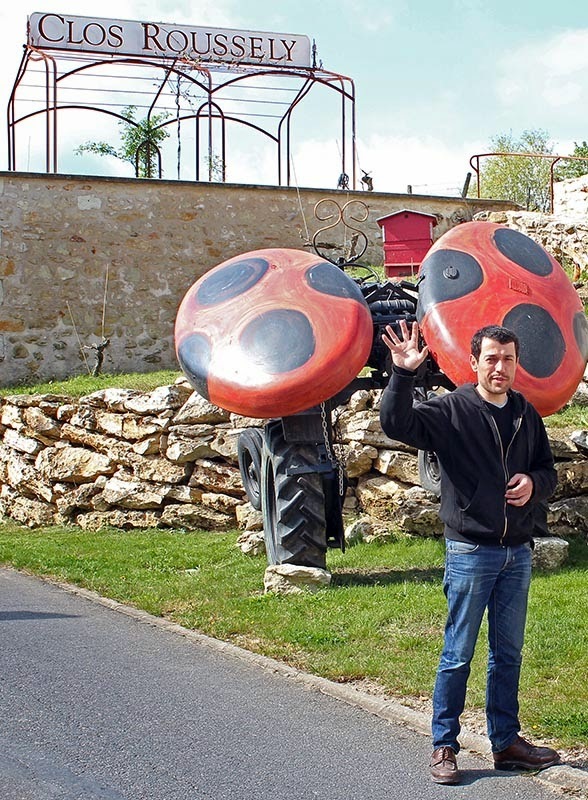 Vincent Roussely outside his winery in Angé, Touraine. 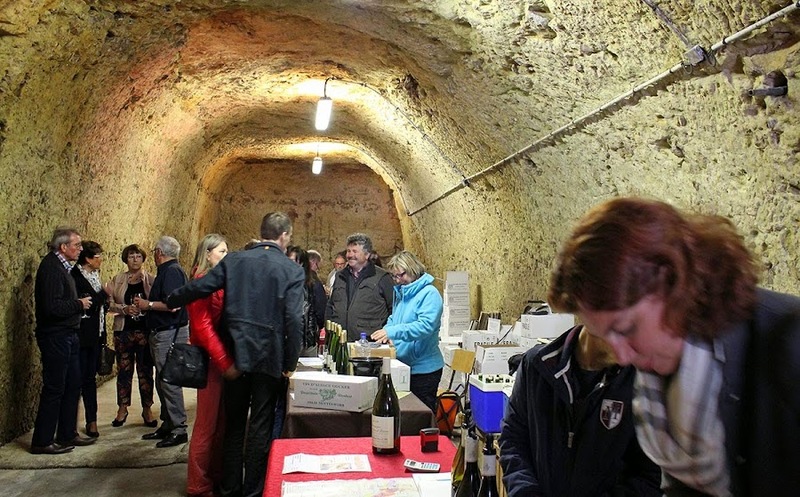 The event was held inside the winery's cave (cellar) and featured winemakers from Champagne, Hautes Côtes de Beaune and Chablis (Burgundy), and Sablet (Côtes du Rhône villages), along with Vincent's own wines. There were also some local food producers providing samples of their goat cheeses, baked goods, and other treats. I had a good time tasting (I wasn't driving) and brought home twenty liters of local wine (gamay and rosé) along with six bottles of Chablis (chardonnay). It was another beautiful spring day with plenty of warm sunshine and the views of the Cher Valley from up on the heights where the grapes grow was spectacular. The forecast for most of this week is the same. Yay! 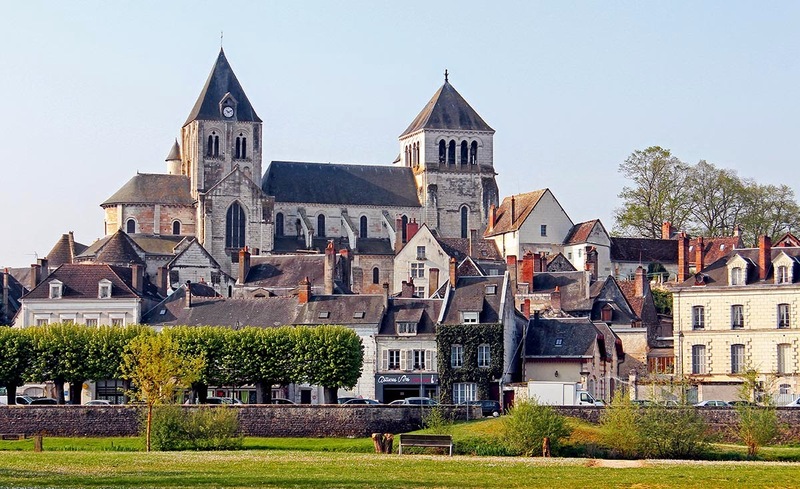 It's called une église collégiale (collegiate church) because it was the realm of a college of cannons, or clergy, and not a monastic church. Catholicism can be very bureaucratic, to say nothing of hierarchical. I took this on Saturday morning after doing my shopping at the weekly market in town. 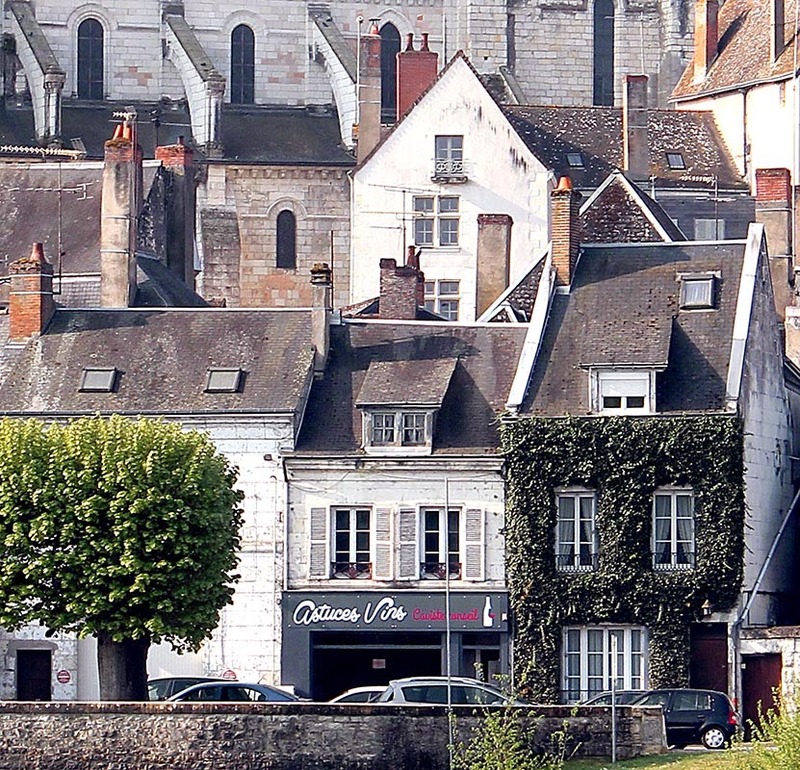 Saint-Aignan's romanesque collégiale and the château (out of the frame to the right) dominate the town's skyline. The day started out a little hazy, but it was not cold and the sun won out making for a gorgeous springtime day. I was inspired to wash windows, so all the windows in the loft/attic are now clean. I also did the window in the living room (not the one that's being replaced next month) and washed the curtains. Spring cleaning continues. I also sat out in the sun for a little while. This new wine shop in town just opened a week or so ago. I haven't been in yet. Here's a closer view from the first photo. It's a new wine shop in Saint-Aignan called Astuces Vins. That's hard for me to translate. Une astuce is the noun form of astuteness, a clever trick, shrewdness. It's like an insider's trick to succeeding at something, in this case, choosing a wine. But calling it "wine tricks" doesn't sound quite right. This is the Cher just downriver from Saint-Aignan. 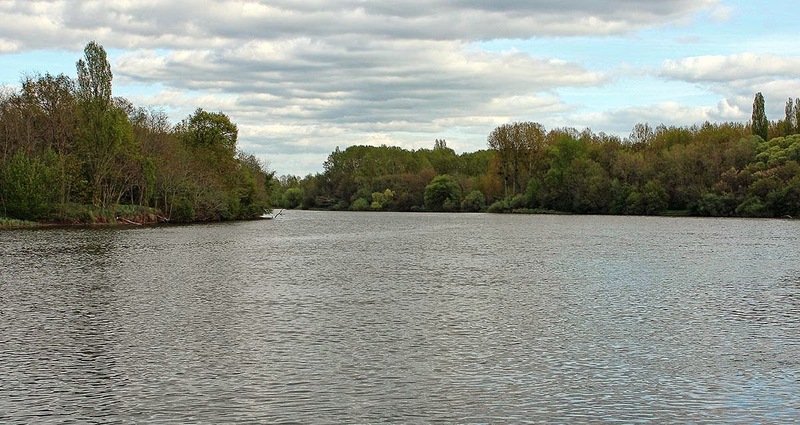 It looks as though I'm on a boat, but I am standing on the bank at a point where the river bends toward the north. I think I've mentioned before that this is not a deep river. I'll bet there are spots where one could wade across, but I've never attempted that. The Cher River on a springtime afternoon. Looking upstream. 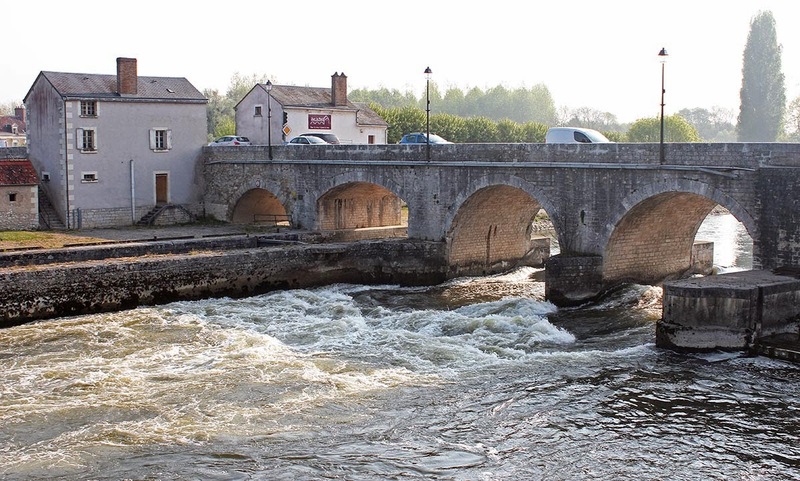 If you head downstream from here, there are a couple of locks to get through (although with a kayak you could just walk it around) before you pass by the town of Montrichard. After that, it's not far until you glide beneath the arches that hold up the Château de Chenonceau, one of the most recognizable, and most popular, of Loire Valley castles. On Tuesday evening, Callie and I took a walk along the river. It's a nice walk when it's not muddy, but the problem is crossing the road at the bottom of the hill; the cars zip by pretty fast and it scares the dog. But she made it across ok. She won't go near the road until I tell her it's ok, then we run across. 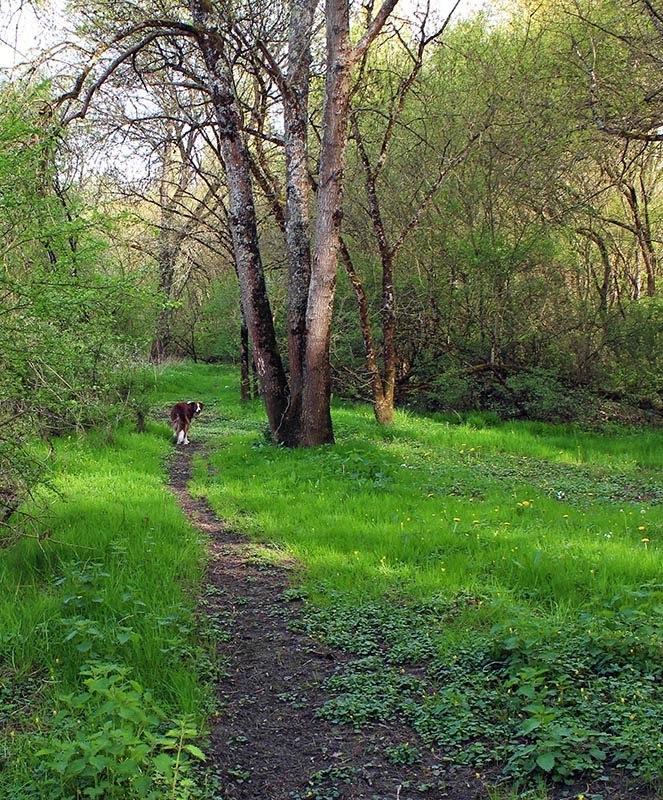 Callie pauses to be sure I'm following as we walk along the river, which is just out of the frame on the left. Once on the other side, it's a short walk to the riverbank. Then we walk along next to the water for a while before heading back up to cross the road again and climbing the hill toward home. 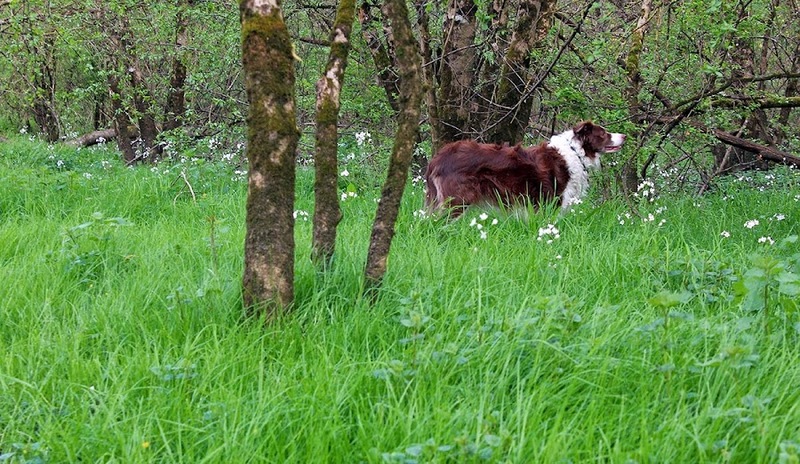 Callie loves sniffing around in the woods, especially woods she doesn't see all that often. And there are ducks! On Wednesday, the guy who owns the vines around us electrified his fence between the vines and the woods on the north side of our house. He does it every spring to help keep the deer from eating the new shoots and grape buds. The rest of the year, when the electricity is off, he lowers a section of the fence so that people can walk from the vineyard down through the woods toward the river. As of now the fence is up and hot. We won't be going that way again until later in the summer. Dandelions. Also called dent-de-lion (lion's tooth) in French. That's, in fact, the origin of the English name. 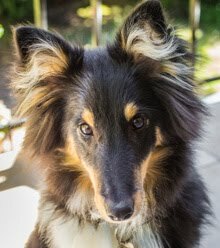 But they're also called pissenlit (which can translate literally to pee-in-bed), perhaps because of their diuretic properties. Our house is up on the hill that you can almost see in the background on the left. The river's at my back. This field is filled with them. It's down at the bottom of our hill next to the river. Of course, I see dandelions everywhere right now. Our yard, the vineyard, and every other place I go. Dandelions are among the early spring flowers and are also among the first to set seed. Once we started our vegetable garden in 2004 (ten years ago! ), I thought it would be nice to have one plot dedicated to herbs. I planted the Simon and Garfunkel herbs (parsley, sage, rosemary, and thyme) along with some tarragon, chervil, and oregano. I was training the rosemary into a kind of simple topiary in the center of the plot; it was one tall woody stem with a ball of leaves at the top. Just as it was getting nice, it froze. Fresh oregano in a planter box. It will bloom with little purple flowers later this summer. I had a hell of a time keeping the herbs going and the weeds down, until the weeds won and I gave up on the herb garden. But we still have the herbs. The sage came from a cutting I made from another patch in the yard, and that's still growing well. I moved the thyme and planted some new rosemary against the southern wall of the house where they've thrived ever since. Tarragon hangs on in a pot that spends its winters indoors. 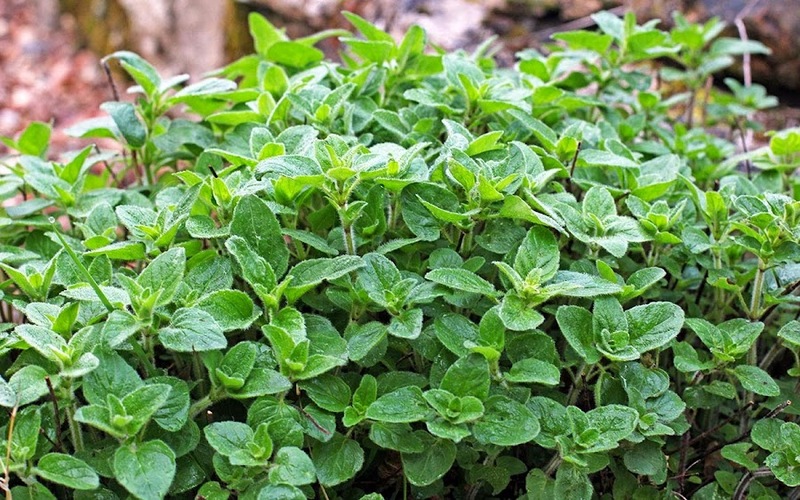 The oregano escaped the garden plot and comes up every year as part of the lawn around the garden. The bunch in the photo above was put into a planter box. It, too, comes back every year. This year I planted some parsley seeds in the box beside it. And I've put chervil seeds out again with the spring crops. Are you going to Scarborough Fair? And I do know that the song is a traditional English ballad from way back, but S&G's version is best known to us Yanks. And while Jamie Oliver and his countrymen say [o-re-GA-no], we say [o-RE-ga-no]. Don't know why. I know, I've been stressing about cutting the grass for the last week. That's because it grows fast this time of year with all the light and water it's getting. And when it's wet it can't be cut, but it still can grow. And grow it does. Freshly cut grass on Monday afternoon. There's more on the north side, around to the right in this picture. But Monday turned out to be the magic day and I spent about two hours in the afternoon guiding the self-propelled lawnmower around the place. This is the second time this year that I've cut the grass. The first time is always more difficult because the yard has to be prepared. Mole hills have to be removed as do all of winter's detritus (downed branches and such). In places the grass is really thick and needs a couple of passes. The ground is often spongy because of the mole runs and that tends to bog the mower down. But after that it gets easier, unless it goes too long between mowings. We're smothered in fog this morning* and the grass is heavy with dew. Just what I wasn't hoping for. Maybe it will dry out by this afternoon so that I can cut it. Sunday, by contrast, was clear and dry. Of course, cutting the grass on Sunday afternoon goes against our noise ordinance, so I waited. I saw this critter on Sunday afternoon's walk with Callie. I spent the afternoon watching the final two matches of the Davis Cup quarterfinals. France needed all five matches to beat Germany (3:2) in some very exciting and, at times, emotional tennis. Richard Gasquet was sidelined due to injury. Michael Llodra replaced him and with Julien Bennetteau battled through four sets to bring France up from a 2:0 deficit in Saturday's doubles match. The guys played in Alsace, so they were on home turf with the fans rooting loudly for them, which I think helped. Tsonga and Monfils played two very strong singles matches on Sunday for the win. In the other quarters, Italy pulled an upset over Great Britain, and Switzerland beat Kazakhastan, both 3:2 scores. The only sweep was the Czech Republic over Japan, 5:0. France will face the Czechs in September. * The fog burned off pretty early, so now we have sun. The grass should dry out by mid-day. I didn't notice this when I took the photo, but the visible street number in this scene (#4) is the same as in the previous one (with the bollards). Funny the things you notice after the fact. 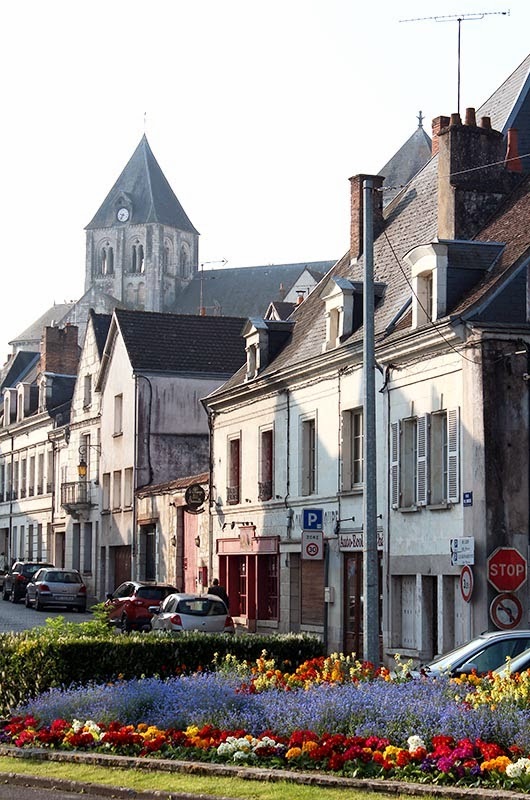 Another view from the center of Le Grand-Pressigny. In garden news, my radishes have sprouted out among the spring crops, but nothing else yet. And the damned moles are active out there. They've pushed up the soil under at least one row of spinach seeds. I gently pressed it back down. They won't eat the seeds or the roots (once the plants grow), but they do disrupt the soil. Arrgh! The rhubarb is also coming back nicely, except two of the plants decided to flower this year. I cut the flower heads off as soon as I noticed them. It may be time to dig up and divide them again. 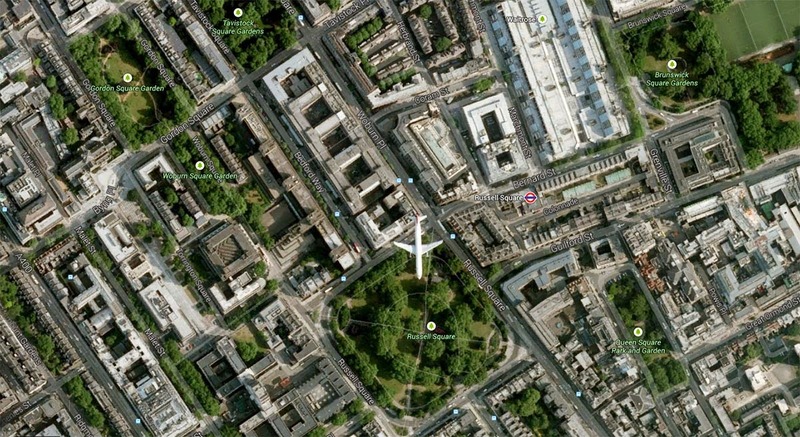 Do you ever just play with Google maps/earth? I usually start out innocently enough by looking something up (hey, I wonder where that is?). Then my exploration starts and I'm halfway around the globe looking at cities, airports, buildings, and rivers in satellite view. I've always been fascinated by maps and Google Earth is like cotton candy to my sweet tooth. Can you see the jet in the center, just above Russel Square? Image captured from Google Maps/Satellite View. The other day I was tooling around London's posh Bloomsbury district and was surprised by the sight above. An airliner heading south, just about before it would turn west to land at Heathrow -- that's an assumption on my part given where the plane is and the direction it's going; it could have been heading further south to Gatwick. I did a screen capture to save the image, and Bob's your uncle. Cheerio, guv'nah. It rained most of the day yesterday, through the night, and it's continuing this morning. It's not really rain, it's more like a heavy mist called bruine in French. Still, everything is wet this morning and there are puddles in the road. Callie will get wet and dirty on her walk. 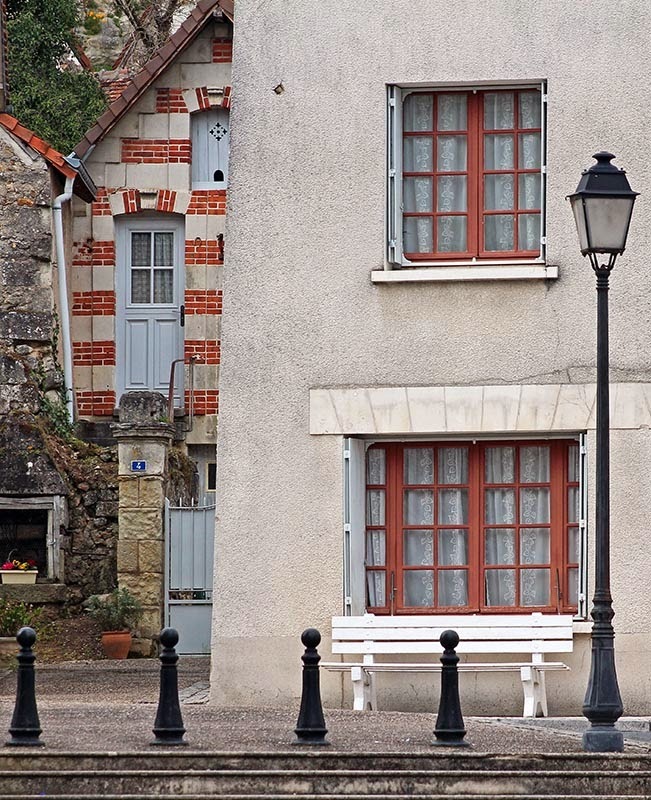 A street scene in Le Grand-Pressigny. 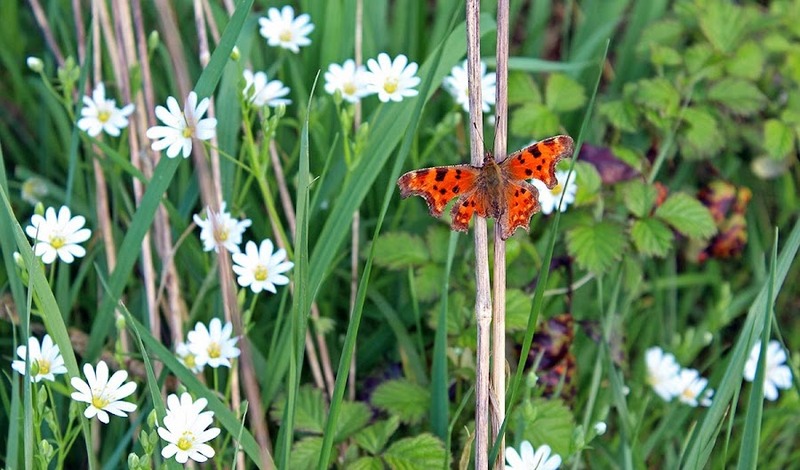 I'm still posting photos from our walk there nearly two weeks ago. Maybe one day those little bollards will grow up to be a lamppost like their mom. For some reason I slept until eight o'clock this morning. It's probably the combination of the overcast skies (so it feels dark) and that fact that we turned our clocks ahead last weekend. Poor Bertie must have wondered if he was going to get his breakfast this morning. Indeed, I got a stern "where the hell have you been?" meow when I went down with his food. 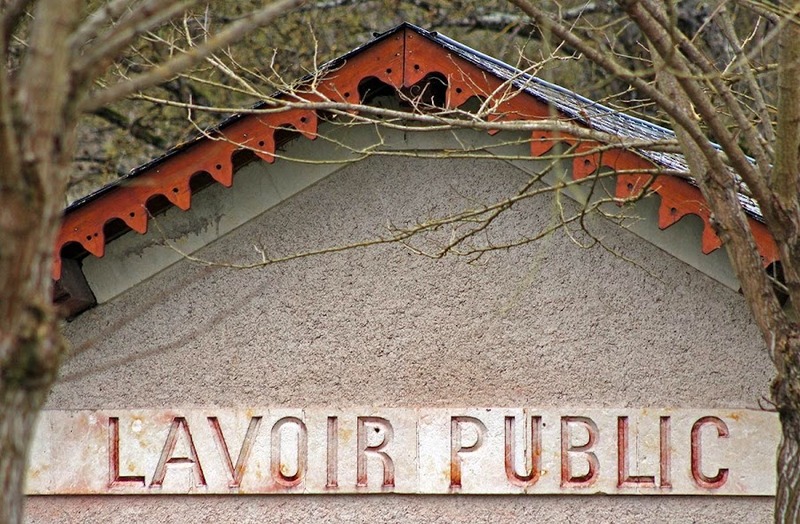 You can still find these old lavoirs publics (public laundries) around rural France (and even in some larger towns and cities). They are simple buildings built along a water course with shallow basins for washing and rinsing clothes. The water is supplied by the river or stream they're built on. I don't think anyone uses them anymore, but they're historic and often restored and incorporated into waterfront parks. 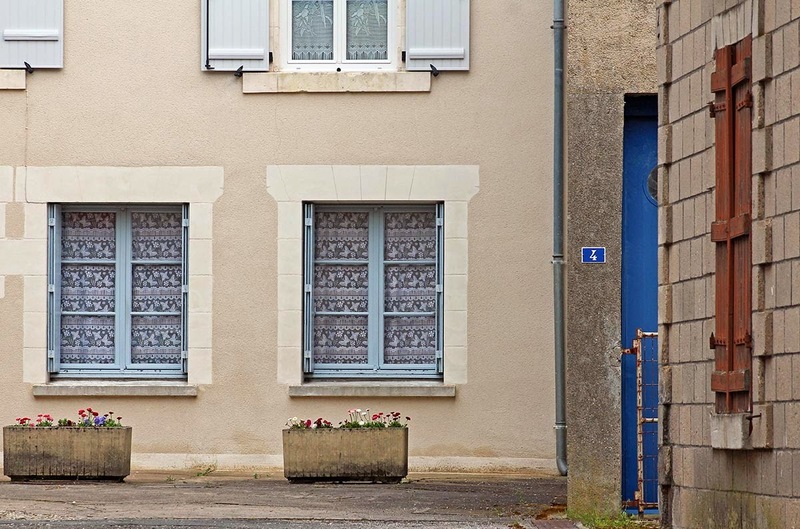 The public laundry building in Le Grand-Pressigny. I've been doing laundry here (at home) these past few days since I've been able to hang things out on the line to dry. I did another load overnight, but we're expecting rain today so those things will have to hang indoors. It turns out that March indeed went out like the proverbial lamb this year. The past couple of days have been very gentle, and yesterday was beautiful. Besides my doctor's appointment, the only things I really accomplished were getting the deck furniture up out of the garage, watering the spring crops (they haven't germinated yet), and making lunch. I spent the afternoon sitting outdoors reading the autobiography of Clarissa Dickson Wright. 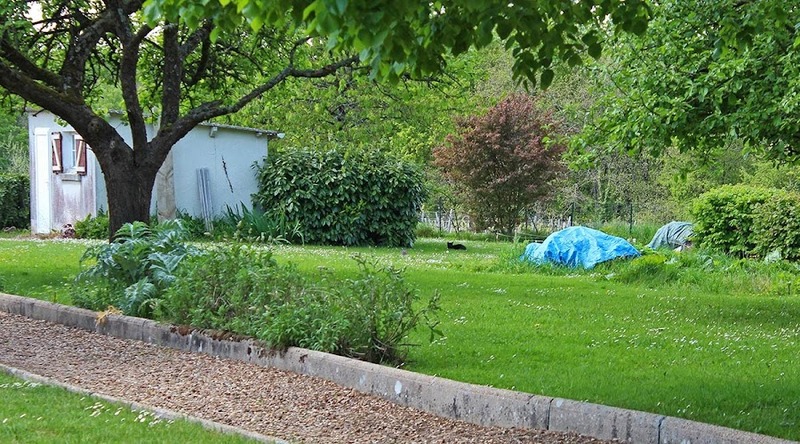 The back yard and vegetable garden plots on 01 April 2014. I took some photos of the yard and garden as well. But I'm not used to so much sunshine and I slightly over exposed my shots. This one isn't too bad, but I still had to darken it down in Photoshop. You can see the four-square vegetable garden and the long planting strip on the lower left. Ken tilled some of it up before his trip. The blue tarp is covering some yard waste that we plan to burn soon. Behind the garden plots you can see the apple trees. They're all budded out and the blossoms are forming now. To the right of center is Callie sniffing for lizards. She caught one later in the afternoon and actually had it in her mouth before flinging it away. She seriously injured it and all it could do was lie twitching on its back. I moved the poor critter so that Callie would leave it alone. It either recovered or became food for someone else. The forsythia (on the right) are finishing up their blooms now and every day more green leaves replace the yellow blossoms. The pinkish/purple tree is a fruitless variety of prunus whose blossoms are getting ready to open. I'm sure I'll take pictures of that when it happens as it's a very pretty sight. I assume this is a rental property or someone's private vacation home. 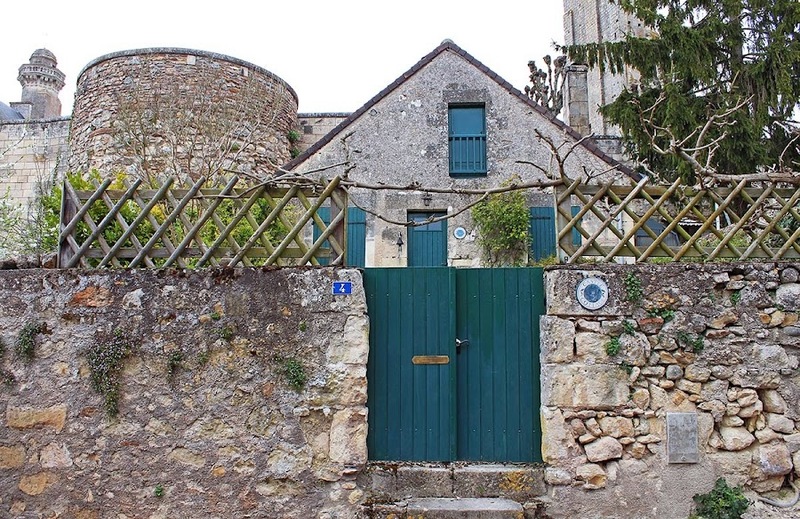 It's built up against the ramparts of the castle at Le Grand-Pressigny, about an hour south of us. The sign says "Castle Cottage," leading me to believe the owners are British. Blue-green paint on the gate, door, shutters, and window trim. I had a very productive Monday. In the morning, I power-washed the deck. Now it's ready for a season of barbequing and eating al fresco. I also got one of our mini-greenhouses set up out there for the new seedlings. Tomatoes, peppers, and eggplant are all sprouting now. After lunch I cut the grass in the north forty, the section of our yard on the north side of the house. I left a big patch of primroses, but the rest of the grass really needed to be cut before it got any longer. The weather was great, sunny with a high of 18ºC (about 64ºF). And that's no April Fool.